Andrzej T. Galecki, M.D., Ph.D. Note: The second edition is now available via online retailers. You can view a brief promotional video from the three authors here. This book provides readers with a practical introduction to the theory and applications of linear mixed models, and introduces the fitting and interpretation of several types of linear mixed models using the statistical software packages SAS (PROC MIXED), SPSS (the MIXED and GENLINMIXED procedures), Stata (mixed / xtmixed), R (the lme() and lmer() functions), and HLM (Hierarchical Linear Models). The book focuses on the statistical meaning behind linear mixed models. Why fit them? Why are they important? When are they applicable? What do they mean for research conclusions? 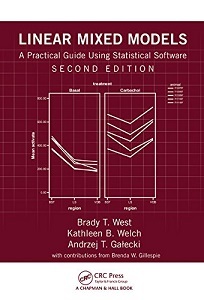 The book also presents and compares practical, step-by-step analyses of real-world data sets in all of the aforementioned software packages, allowing readers to compare and contrast the packages in terms of their syntax/code, ease of use, available methods and options, and relative advantages. The book was nominated for the 2009 Ziegel Prize, sponsored by the Journal Technometrics and honoring a first edition with clearly discussed statistical methodology that "brings together in one volume a body of material previously only available in scattered research articles and having the potential to significantly improve practice in engineering and science." 1. Thomas Lumley has posted a new (and experimental!) R package for fitting mixed-effects models to complex sample survey data! The R community has been waiting for this for a long time, and this is a very nice breakthrough. Keep in mind that the package is still experimental. 2. Check out this excellent article in the Journal of Cognition that walks readers through appropriate (and general!) methods for performing simulation-based power analyses in R for mixed-effects models. 3. Here is a recent article comparing the performance of several popular multilevel modeling software packages. 4. See this link for a fix to the problem with the gls() function in the R nlme package, discussed in Chapter 6. 5. BAYESIAN ANALYSIS: For examples of Bayesian approaches to the analysis of the data sets in each chapter in SAS and R, click on our Bayesian Analysis in SAS page or our Bayesian Analysis in R page. You should also check out the Stan web page, and the web page for "The BUGS Book" (forthcoming). A new R package named brms is now available as well, which makes it very easy to use the Stan machinery in the background to fit mixed-effects models using Bayesian methodology. We agree with recent posts on the strengths of this approach relative to the more traditional frequentist approaches covered in our book, and strongly encourage readers to take advantage of this package's features and work with Stan to fit these models, especially when your research objectives involve making inference about variance components. We have prepared a worked example from Chapter 6 that walks readers through the use of this package. 6. POWER ANALYSIS AND EFFECT SIZES: A brand new R function entitled powerlmm has been developed enabling quick and easy power analyses for two- and three-level multilevel models. Check out the slides linked here for an easy-to-read introduction! Those interested in power analysis and sample size calculations for study designs that are multilevel and/or longitudinal in nature can also check out this site for some very helpful free software and documentation (the Optimal Design software package) developed at the University of Michigan. Additional free simulation-based software and documentation for power analysis in multilevel designs can be found here. We have also prepared an example of a simulation program in SAS for the second edition of the book that can be downloaded here for example power calculations. Also, Dr. West recently reviewed an excellent new book on power analysis for multilevel studies that is really a must-have for anyone designing these types of studies. Finally, check out this very cool effect size calculator, which accommodates correlated data! 7. An R package containing the data sets for the book, WWGbook, has been posted on CRAN. Please visit the R Project site for links to CRAN mirrors. 8. Use of the lmerTest package in R should be properly cited as follows: Alexandra Kuznetsova, Per Bruun Brockhoff, Rune Haubo, and Bojesen Christensen (2014). lmerTest: Tests for random and fixed effects for linear mixed effect models (lmer objects of lme4 package). R package version 2.0-13/r71. http://R-Forge.R-project.org/projects/lmertest/. Errata for the second edition can be found here. Please direct any questions and/or comments to Brady West (bwest@umich.edu).